Chapulling is a new word coined in Gezi Park, Istanbul, Turkey that means resisting to pressure and seeking for justice and equality for all. Since May 2013 Turkey has experienced the largest wave of civil disobedience with citizens protesting lack of personal freedoms, lack of free media, abuse of power and issues related to urban development & neoliberal policies. The protests were sparked by outrage at the brutal eviction of a peaceful sit in at Gezi Park, a small patch of green in downtown Istanbul where officials were planning to build a shopping mall. The movement has been marked by absence of a centralized leadership and its initial ability to bring together disparate fractions against an increasingly autocractic government. By September 14th, 2013, six people have lost their lives due to police violence. November 3, 2002--The Justice and Development Party (AKP) wins general elections in Turkey and Recep Tayyip Erdoğan becomes the 25th Prime Minister of the Turkish Republic. · AKP’s blend of Islamism and neoliberalism is supported by religious conservatives in rural areas and by business communities in urban areas. · AKP also appeals to liberal intellectuals who interpret their moderate Islamist and anti-military stance as pro-democratic. · AKP’s neoliberal policies lead to economic growth in Turkey due to increased foreign investment, though the profits gained did not have a trickle-down effect. June 2007, AKP officially launches the Ergenekon investigation, which accuses many high ranking Turkish generals and prominent intellectuals of being members of a secret terrorist organization plotting to instigate a military coup. AKP name­­s this so-called terrorist organization, Ergenekon. July 10, 2007--The World Bank classifies Turkey as an upper-middle income country in terms of the country's per capita GDP. July 22, 2007--AKP is re-elected. August 21, 2007—Among a myriad of urban regeneration projects, the Istanbul Municipality announces it will reconfigure the area around Taksim Square. * The Taksim regeneration project leads to the eventual emergence of “Taksim Solidarity Platform,” which brings together environmental activists and professional organizations such as Federation of Engineers and Architects Associations of Turkey, Urban Planners Association, Mapping and Cadastral Surveyors Association and Beyoglu Neighborhood Club. Concerns over land use include finance-centered economy being too focused on making maximum profit for urban land despite the toll it takes on middle and lower class citizens, on the culture, and on the environment. August 28, 2007-- Foreign Minister Abdullah Gul sworn in as Turkey's 11th president. Both the President and Prime Minister in Turkey have Islamist backgrounds, a first since the establishment of secularism in the country in 1923. October 21, 2007—AKP wins a constitutional referendum that rearranges presidential elections and alters the quorum in parliament from 367 to 184. Jan 1, 2009--TRT6, Turkey’s first Kurdish-language public TV-channel is launched, thus giving an air of democratic appeal to AKP. September 12, 2010-- AKP wins a 2nd constitutional referendum that consolidates legislative, executive and judiciary powers and purges the military. June 12, 2011--AKP gets re-elected. August 30, 2011 -- The Victory Day national holiday celebrations that mainly honor the military are cancelled due to increased terror incidents and casualties among Turkish soldiers. October 29, 2011 -- The Republic Day national holiday celebrations are cancelled due to the earthquake in Van. March 30, 2012 -- The Grand National Assembly passes an education reform bill extending the length of compulsory education from eight years to twelve, rearranging the education system to a 4+4+4 format where students spend 4 years each in elementary, middle and high school. Reform legislation also makes it possible for middle school students to attend Islamic schools by reversing a measure, imposed by the military in 1997, that had closed religious schools to middle school students. April 2012-- Journalist Banu Avar’s documentary series entitled New World Order on Art TV investigate the Great Middle East Project, suggesting an alarmist yet highly popular theory that instigating instability in the Middle East is part of an imperialist master plan to control energy resources in the region. May 4, 2012-- Documentary filmmaker Imre Azem releases Ekumenopolis: the City Without Limits to show how neoliberal policies and privatization have ignored and trampled upon public interests in pursuit of financial profit. The city of İstanbul is disproportionately growing in a way that will soon render its resources insufficient for supporting its inhabitants. June 8, 2012 -- After much controversy and protests AKP drops plans for a controversial bill that would have made it impossible for poor women to receive legal abortions. Turkey legalized abortion for medical reasons in 1965, broadening the right in 1983 to all women in the first 10 weeks of pregnancy. Erdogan opposes abortion as well as birth control, calls for women to have at least three children, and his party intended to criminalize adultery in 2004 but backed off under pressure from the European Union. August 30, 2012 -- Victory Day national holiday celebrations are cancelled due to the President’s illness. September, 2012-- 330 members of the Turkish military are convicted without proof of plotting a coup in 2003 and sentenced to lengthy jail terms. December 11, 2012-- Committee to Protect Journalists report a record number of 49 journalists are behind bars in Turkey. Broadly worded anti-terror and penal code statutes allow Turkish authorities to conflate the investigation of sensitive topics with terrorism or other anti-state activity. December, 2012 -- Taksim Solidarity Platform starts a petition against the Municipality’s plans to destroy the Gezi Park, the last remaining green space in the center of Istanbul, to build a commercial complex in Taksim Square. The platform also organizes press conferences, marches and other activities to raise awareness. April 5, 2013 -- The abbreviation "T.C." (Turkish Republic), the customary prefix for all government institutions is removed from government buildings and signage. Many people protest by adding a TC to their name on social media. April 15, 2013 -- A Turkish court on Monday convicted top Turkish pianist and composer Fazil Say of denigrating religion through comments he made on Twitter. Say joked about a call to prayer lasting only 22 seconds. Say tweeted: "Why such haste? Have you got a mistress waiting or a raki on the table?" May 1, 2013 -- May Day events are banned. AKP orders to halt public transportation as a precaution. Armed with water cannons and tear gas, police battle trade unionists and members of political parties to keep them from entering Taksim Square for May Day demonstrations. 25 civilians are injured in clashes, raising concerns over the constitutional right to assemble and freedom of expression. May 3, 2013 -- 49% government owned Turkish Airlines bars its flight attendants from wearing red lipstick and nail polish to try and keep its crew appearance "artless and well-groomed with makeup in pastel tones.” The ban raise concerns over individual rights and government’s executive micromanamgement of irerelavant issues vs urgent government matters. Outrage spills into social media, sparking newspapers columns. May 11, 2013 -- Reyhanlı bombings near the Syrian border. In the deadliest single act of terrorism on Turkish soil, two car bombs explode on the Syrian border. While the official death toll is at 50, it is widely believed to be around 150-200. All oral, written, and visual publications relating to the scenes of incidents are banned. Several media unions protest the media ban imposed on the Reyhanlı bombings, which raise concerns over freedom of the press and transparency of government activities. May 16, 2013 --Erdoğan pays an official visit to the United States to visit Barack Obama to discuss the Syrian crisis. Both leaders reaffirm their commitment to topple the Assad regime. Turkish public opinion, especially in border towns, is strongly opposed to a war with Syria. May 18, 2013 --Protesters clash with police in Reyhanlı. Not much is known due to media ban on the subject which further concern citizens. May 19, 2013 -- National holiday celebrations that honor the youth ar cancelled due to the Reyhanli bombings. The frequent cancellation of national holidays lead to concerns over Erdogan’s dedication to the concept of “republic” as a form of government. May 24, 2013 -- AKP introduces a law to prohibit retail sales of alcoholic beverages between 10pm and 6am, ban all alcohol advertising and promotion, and stop new shops and bars from opening within 300 feet of schools and mosques, thus raising concerns over personal freedoms. May 25, 20013 -- In response to the public announcements at subway stations in Ankara warning against public display of affection, dozens of couples organize via social media to stage a kissing protest to express their concerns over government interfering with personal freedoms. May 27 2013 -- News of demolition of Gezi Park prompt 50 activists, mostly members of the Taksim Solidarity Platform, to camp out at Gezi Park adjacent to Taksim Square to protect the trees with a peaceful sit in. May 28, 2013 -- Police in riot gear move in to clear the square. 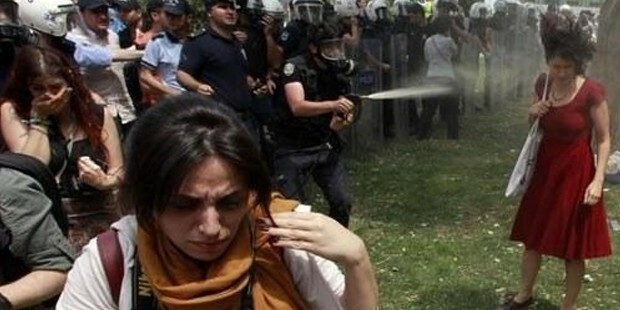 A Reuters photographer, Osman Orsal, captures the iconic image of “woman in red” holding her ground while being sprayed in the face by the police at close range. The woman turns out to be Ceyda Sungur, a Research Associate at the Urban Planning Department at Istanbul Technical University. May 28, 2013 -- Sitki Sureyya Onder, Istanbul Deputy of the Peace and Democracy Party (BDP) stands in front of the bulldozers and demands to see the legal documents permitting the demolition of Gezi Park. The officials end up having to halt the demolition since they had no documents. Onder is later joined by the Republican People's Party (CHP) Chair Deputy, Gursel Tekin, and other party officials. Meanwhile, in defense of AKP’s restrictions on alcohol, Turkish PM Erdogan says: “When two drunkards make a law, you respect it. But when we make a law for something that faith orders, you reject it. Why?” Erdogan’s apparent denunciation of Ataturk, the founder of the Turkish Republic, and his comrade Ismet Inonu and advocacy for legislating Islamic morality outrage many Turkish citizens and further intensify concerns over AKP’s encroachment on secular and personal freedoms. May 30, 2013 -- Police use water cannons and tear gas to disperse demonstrators at 5am. Over 100 people are injured and 60 detained. Videos showing the extent of police brutality start to surface on social media. Outraged by police violence against peaceful protestors and already exasperated by issues of freedom of the press, freedom of expression, freedom of assembly and government's infringement on private life, thousands join in the protest. May 31, 2013 -- Protesters spread from Ankara to Izmir, from Adana to Antakya, and all across the nation with the slogans "Everywhere is Taksim, everywhere is resistance." Hundreds are injured, many are blinded as police directly aim their gas banisters and plastic bullets at people’s heads. Some businessmen announce they will not open stores at a future shopping mall built at Gezi Park under such strong consumer opposition. Amnesty International condemns disproportionate use of force by police. Carsi, supporter group of Besiktas, one of Istanbul’s three major soccer teams, successfully resists the police by building barricades and catching and throwing back the gas capsules fired by the police. Already infamous for their left leaning anarchist stance, Carsi becomes a legendary figure of the protests. June 1, 2013 -- Thousands of protesters from the Asian side of Istanbul walk across the Bosphorus Bridge to join the protests in Taksim, the European side of the city. Australian exchange student Kate Mullen becomes an icon of resistance as she is photographed standing alone in front of a TOMA power spraying water directly at her. Erdogan gives a defiant televised speech condemning the protesters. People start banging on pots, pans, blowing whistles from their balconies to express solidarity with the protestors. 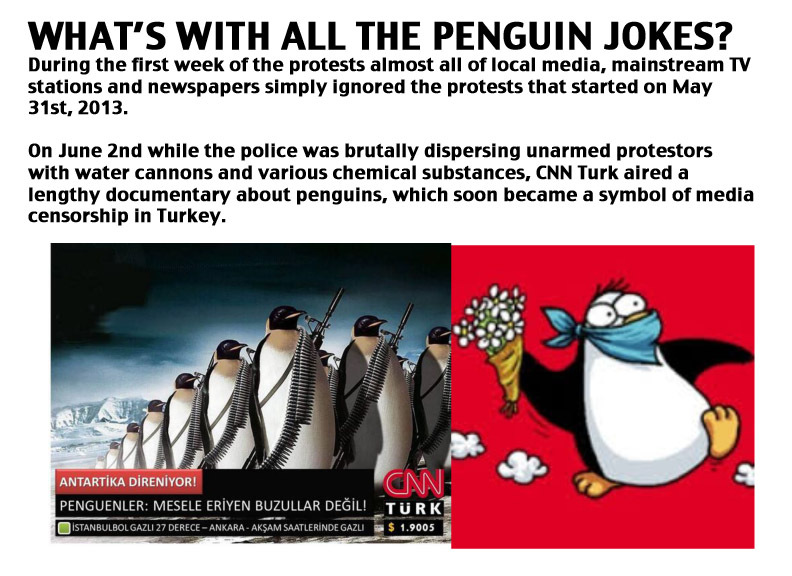 CNN-Turk become the symbol of auto censorship of media in Turkey by opting to play a three-part documentary about penguins rather than cover the protests. June 1, 2013-- Ethem Sarisuluk, a 26-year old protester, is shot in the head by a police bullet in Ankara and listed in critical condition. June 2, 2013 -- The Prime Minister calls protesters capulcu/looter, the meaning of which the protesters playfully subvert. They Anglicize it as “chapuller” and verbify it as “chapulling” to mean "fighting for your rights." 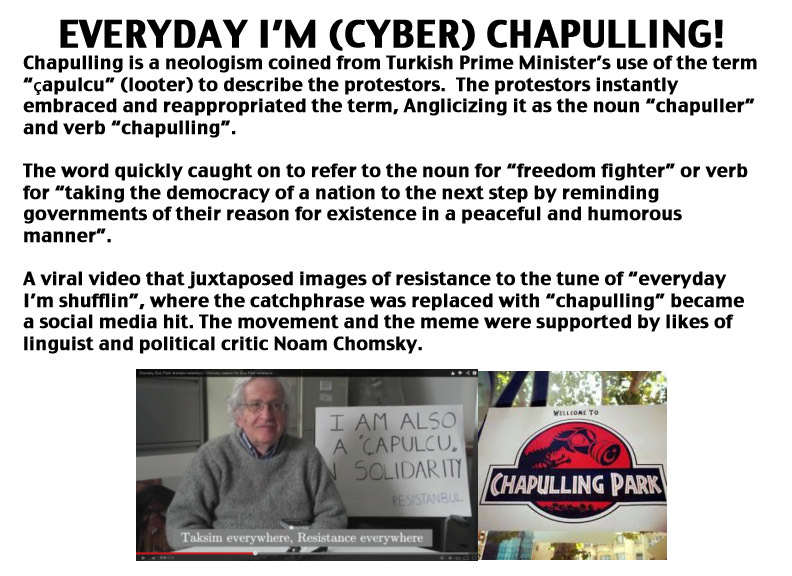 Prominent global public figures like the linguist and political critic, Noam Chomsky, identify themselves as chapullers, and state "everywhere is Taksim, everywhere is resistance." Meanwhile, frustrated by lack of media coverage, three Turkish expats launch an Indiegogo campaign to put a full page ad in the New York Times and end up breaking a crowdsourcing record. June 3, 2013 -- Mehmet Ayvalitas, 19, is killed by a taxi which rammed demonstrators in Istanbul. Ali Ismail Korkmaz, 19, is in critical condition after being attacked by a gang of unknown persons in Eskisehir. Helicopters fire tear gas canisters into residential neighborhoods and police use tear gas to try to smoke people out of buildings. Unions call a general strike in response to "state terrorism." Dolmabahçe Mosque welcomes wounded protesters. Erdoğan leaves Turkey on a planned three-day tour of North African countries. Meanwhile, despite police brutality all around, Gezi Park has a carnival atmosphere where disparate groups such as environmentalists, revolutionaries, Marxists, Kurdish activists, Turkish nationalists, feminists, anti-capitalist Muslims, LGTB advocates and artists unite in neighboring tents. The protestors establish a make-shift library and a “free market” where food donations and other supplies are distributed at no cost. June 4, 2013-- A 22 year old unarmed protester, Abdullah Comert is dead due to a head concussion in Hatay, near the Syrian border. With Erdogan abroad, deputy Prime Minister Bulent Arinc calls the police crackdown "wrong and unjust" and offers talks with protesters. As clashes with police continue throughout the country, police in Istanbul is careful not to cross the Gezi Park barricades built by the protestors. The hacktivist group RedHack hacks close to 150 government and pro-AKP media sites. June 6, 2013-- The Taksim Solidarity Platform tent at Gezi Park holds a public assembly. AKP prepares for Erdogan’s return by running an a text message campaign and organizing shuttles to gather thousands of supporters at the airport, extending the public transportation hours until 4am. Erdogan addresses crowd of 10,000 supporters, who chant: "We will die for you, Erdogan." June 7, 2013-- The NY Times publishes the informative ad initiated by the Turkish expats alerting international audiences to the events unfolding in Turkey as well as censorship of media. Ironically, the very same day all 6 pro-government daily papers have identical headlines praising Erdogan for his dedication to democracy. The police dismantls the tents of protesters occupying Kugulu Park in Ankara. June 8, 2013—Police mainly stay out of Gezi Park while protesters hang various banners and flags on the Atatürk Cultural Center adjacent to Taksim Square in Istanbul. Supporters of three rival soccer teams: Besiktas, Fenerbahce and Galatasaray unite for a display of solidarity. June 9, 2013-- Hundreds of thousands gather in Taksim. Nationwide clashes with the police continue. Erdogan reiterates that he will proceed with his plans in Taksim and also demolish the Ataturk Cultural Center. Erdogan also accuses protesters who took shelter inside the Dolmabahce Mosque of drunken and inappropriate behavior, despite evidence to the contrary. June 10, 2013-- Rating's agency Moody's warns Turkey that ongoing protests would result in significant credit risks. Deputy Prime Minister Arinc states that Erdogan had agreed to meet protest organizers on June 13th but warns government would "no longer tolerate 'illegal acts.” Gul confirms legislature on alcohol use. June 11, 2013—A group of undercover police stage assault with molotov cocktails in an attempt to negatively portray the protesters. Meanwhile, a group of protesting lawyers during a press conference at Caglayan Courthouse are brutally detained by riot police, arresting 49 lawyers. Numerous high ranking deputies visit the park and many suffer from the teargas in the area. The antennas boosting mobile phone reception are set fire by the police. June 12, 2013-- Ethem Sarisuluk, 26, is confirmed braindead. Videos of Sarisuluk being shot in the head by a riot police widely circulate in social media. The state-owned Anadolu Agency covers G8 protests in London and attempts to stir a social media campaign around the hashtag #occupylondon. A German pianist on a world tour gives a 14-hour piano recital in the middle of Taksim square. Eight female deputies in the Italian parliament wear red to express solidarity with the woman in red. June 13, 2013--Erdogan meets several popular celebrities of his choice, who have no ties to the resistance, to discuss the Gezi events. Sarisuluk’s family sues Interior Minister, Ankara Mayor and Police Chief for abuse of power. The Ministry of Health asks the Istanbul Medical Chamber to turn in the medical records and confidential information of all patients seeking first aid. 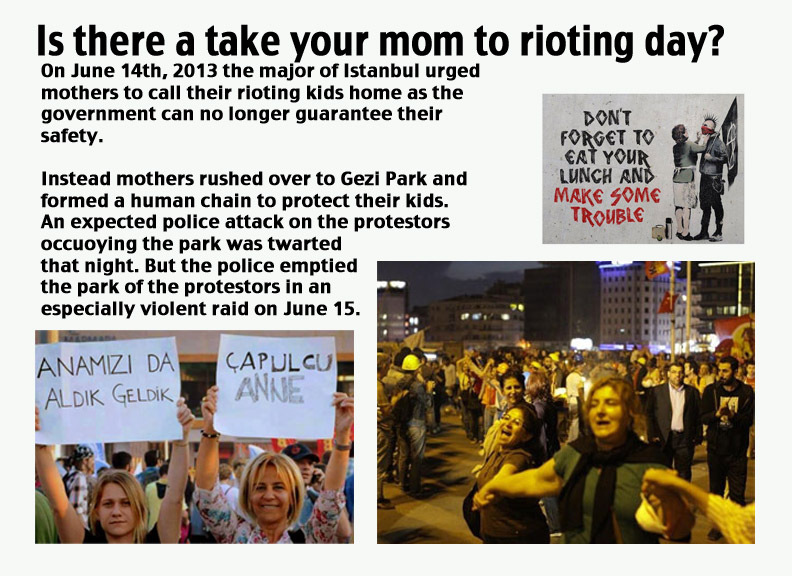 June 14 2013—The mayor of Istanbul urges mothers to call their rioting kids home as the government can no longer guarantee their safety. Instead, mothers rush over to Gezi Park and form a human chain to protect their kids to thwart an expected police attack that night. June 15, 2013—Hundreds are hurt as police violently clears the Gezi park, torching tents and everything in sight. Police close the park to public. The police chase the protestors to the nearby Divan Hotel Istanbul, and attacks the hotel with tear gas and water canons for aiding and harboring protesters. German Green Party member Claudia Roth is among the victims inside Divan Hotel. A crowd attempting to cross the Bosphorus Bridge from Kadikoy to aid the protestors on the European side is violently stopped and dispersed. June 16, 2013-- The police cordons off Taksim Square. An armed militia of government supporters or undercover police accompany the police. Armed with batons, a group of 35-40 people attack the offices of the opposition party CHP’s windows in Sishane. The police detain doctors inside the Ramada Hotel for treating the injured protesters. Members of Çarşı are detained in their homes for taking an active role in protests. A 14 year old hit by a canister on his way to the market is listed in critical condition. Dilan Dursun, 20, who got hurt in Ankara is unconscious. The police interrupt and disperse Sarisuluk’s funeral with teargas. June 17, 2013-- Unions call for a day of strike. Around 6pm, people notice a man standing still in the middle of Taksim Square in Istanbul. He stands motionless for a total of 8 hours. Within a couple of hours, people are standing still en masse in various parts of the world. 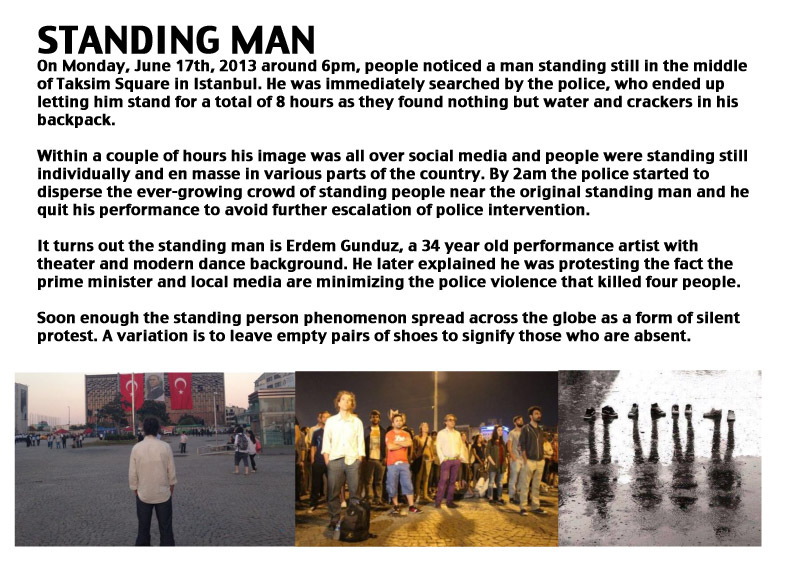 It turns out the standing man is Erdem Gunduz, a 34 year old performance artist with theater and modern dance background protesting police brutality and media censorship. June 18, 2013-- Protests break out in Brazil. The Istanbul Doctors Association report that the water used by police in water cannons have an irritant chemical mixed into it. Chemical Engineers Association suggest the chemicals used by the police fits the definition of chemical warfare and should be banned. The pro-AKP newspaper, Takvim, publishes a fake interview with Christiane Amanpour. June 25, 2013 -- By now the civil disobedient movement grew to include boycott lists, moneyless swap meetings, local discussion forum in all major cities where locals come together to exchange ideas. June 28, 2003-- 18 year old Medeni Yildirim dies as he is shot in the back while protesting in Lice, near Diyarbakir in southeast Turkey. June 29, 2013 -- Los Angeles Gezi Forum meets at the 18th Street Arts Center to discuss the civil disobedience movement in Turkey and seek meaningful ways to become a part of the dialogue. June 30, 2013 -- Thousands of citizens join the peaceful LGBT pride march in Taksim. Armed with knives and sticks, a mob of 20 attack marchers in Kadikoy, wounding two protesters. July 2, 2013 -- Istanbul Administration Court blocks the Gezi Park redevelopment project. July 6, 2013 -- In the Talimhane district of Istanbul, next to Taksim, Sabri Celebi sways his machete at the crowds running away from the police. He is captured on video kicking a young woman in the back and hitting her with the side of his machete with police standing nearby. Celebi is briefly detained and released. Meanwhile, the parliament approves a law that removes the authority of Association of Turkish Engineers and Architects over maps, plans and projects to give it to the Ministry of Culture. The ministry immediately applies to the Regional Administration Court to overturn the ruling of the Istanbul Administration Court which stopped the Gezi Park construction projects. July 7, 2013 -- Hundreds of thousands attend "1st Gas Man Festival" in Kadıköy, Istanbul to protest the government’s actions in recent days. July 8, 20013 -- A restored Gezi Park is opened by Istanbul governor Hüseyin Avni Mutlu. As people immediately fill up the park, it is cordoned off by police and those inside forcefully are evacuated. Gezi Park is closed to public again. July 10, 2013-- Holly month of Ramadan begins. Anti Capitalist Muslims, who have been active participants of the Gezi protests, call for public iftars, the ceremonial meal breaking the daily fast. For an entire month thousands of observant Muslims and non-practitioners alike come together for mass communal pot-luck dinners on the streets that stretch for blocks. July 13, 2013 -- A group of Turkish expats stage a protest in front of Gulen’s ranch complex in rural Pennsylvania, USA to bring up that his devotees have established roughly 100 charter schools in the United States alone. July 22, 2013 -- The Ministry of Culture's appeal to a higher Regional Court is accepted, leaving no immediate legal obstacles to the construction plans. PM Erdoğan states that if the courts allow construction to proceed, a plebiscite can be a possibility. Can Atalay, lawyer representing the Architects Chamber under the Union of Turkish Engineers and Architects publicly denounces rulings that ignore the official studies and advice of professionals whose job is to make such recommendations. July 30, 2013 -- The Freelance Architects Association of Istanbul (ISMD) announce a design competition for the redevelopment of Gezi Park. More than 250 academics and professionals in the field of architecture sign a petition to stop this competition. At this point Erdogan’s insistence on redeveloping Gezi Park is widely interpreted as symbolic of a greater power struggle with people’s wills and basic rights. July 31, 2013 -- Thousands gather in Taksim Square for a press statement from the father of the seriously-injured 16-year-old protester Berkin Elvan and demand the government to find those responsible for Berkin's injury. August 2, 2013 -- Police raid 20 houses, resulting in the arrest of at least 20 opposition members, particularly targeting the Worker´s Party, the Turkish Youth Unity as well as members of defiant media such as TV channel National/ Ulusal TV and the Light/Aydınlık Newspaper. August 4, 2013 -- Authorities block all access to Silivri, a suburb of Istanbul where Ergenekon court hearings against 275 defendants are to take place. They are accused of treason and aiming to stage a coup against Erdogan. August 5, 2013 -- 19 people are given life sentences, including a former chief of army Mehmet İlker Başbuğ and journalist Tuncay Özkan. Dozens are issued sentences of 12 to 35 years in prison, 21 are acquitted. August 31, 2013 -- A group of Turkish expats stage a second protest in front of Gulen’s ranch in rural Pennsylvania. Sympathy protests take place elsewhere in the USA where protesters highlight Gulen’s use of the American charter school system to subsidize over of his own schools in the USA. 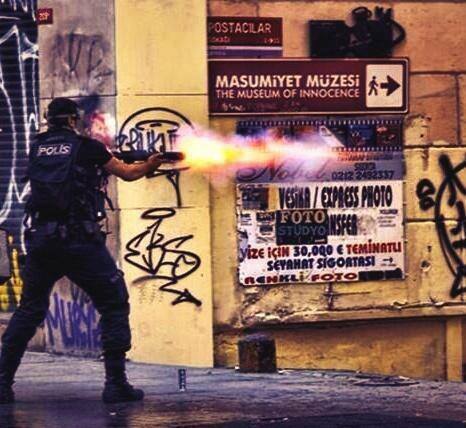 September 2, 2013 -- Turkish interior ministry inspectors confirm that the police used excessive force in Gezi protests. September 7, 2013 -- After a relatively quiet period, street protests re-ignite as police attempt to enter the campus of Middle East Technical University to cut trees in a nearby woodland to construct a new road. 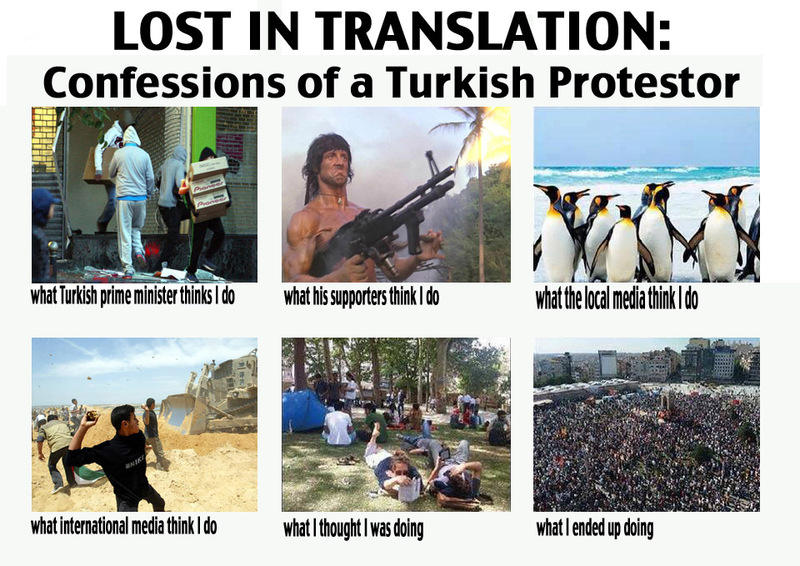 Sympathy protests break out in Istanbul, Izmir and elsewhere. September 8, 2013 -- Police clash with demonstrators in Tuzluçayır near Ankara over a government project that propose a mosque-djemevi combination, a joint organization by Sunni cleric Gülen and Alawii Cem Association. The project would create a hybrid place of worship serving both the Alawii minority and Sunni majority. The Alawii community denounce Cem Association as their representative and oppose the project as an assimilation attempt. September 12, 2013—Female protesters taken into custody report incidents of sexual abuse by police officers who claim to be following the orders of their superiors. September 9, 2013 -- Another 22 year old unarmed protestor Ahmet Atakan dies after the police fires a tear gas banister aimed at his head in Hatay, near the Syrian border. The Ministry of Justice dismisses the case by claiming he died by falling from a height. September 10, 2013 -- The police fire tear gas at the mourners at Atakan’s funeral. Turkish expats gather in front of the Turkish Consulates to protest police brutality in Turkey in simultaneous events in Los Angeles, NY, Washington DC, Boston, Toronto and Madrid. Thousands of protesters clash with police all over Turkey. September 11, 2013 -- The center of protests in Istanbul move from Taksim on the European side to Kadikoy on the Asian side, a liberal neighborhood where a vast majority Gezi protesters reside.